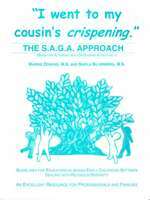 I Went to My Cousin's Crispening by Margie Zeskind, M.S. and Sheila Silverbert, M.S. Guidelines for Educators in Jewish early Childhood Settings - Dealing with Religious Diversity. An Excellent Resource for Professionals and Families. The Jim Joseph Foundation, USA, has awarded a Grant to assist the developers of the S.A.G.A. Approach with the dissemination of this information and the sensitive training of educators. This Foundation is dedicated and committed to the preservation of Judaism and the education of children, within the Jewish Community.